By Doug Smith. Doug is a full-time wheelchair user, having Spina Bifida and Hydrocephalus since birth, and when born, was given only 3 - 6 months to live. Almost 5 decades later, he is still here, and going strong. A keen cruiser he finds this mode of transport ideal for him. Back in 2006 things didn’t look good - no job, no money, no prospects - so I decided to go to college to better myself and my qualifications. I studied an HNC in Travel & Tourism and on completion I was fortunate to get the chance to work for Carnival UK in Southampton. Headquartered in America, Carnival is the world’s largest cruise conglomerate and owns cruise lines such as P&O, Princess, Cunard, Holland America, Seabourn and Costa. My job as a Cruise Consultant involved advising on and booking cruises on a number of the group’s cruise lines, over the telephone, for both travel agents and the general public. I also had the opportunity, on occasion, to show groups of people around some of the ships. I have travelled on a number of cruises myself, and found that accessibility, not only in the cruise terminal, but on board the ships, is second to none. Because I am a full-time wheelchair user, I book a fully accessible cabin, and would have to do so if I was taking an electric scooter or wheelchair. Incidentally, electric scooters and wheelchairs must have a dry cell battery. Wet cell batteries are not allowed on ships and the same rules apply to aircraft. Just before I go on a cruise I check that my passport has at least six months to run from the date of return and, of course, that I have any necessary visas, as well as my documents for boarding, then plan how best to get to the cruise terminal. Options include going by car, taxi, aeroplane, train or coach. Once at the cruise terminal, porters are waiting to take suitcases to put on board, leaving just hand luggage for check-in, and the reverse process works perfectly at the end of the cruise. There are a number of check-in desks which are at a lower height for use by people with disabilities. Onboard, the space is mind-blowing. Accessible cabins have wide doorways for ease of access with a wheelchair or scooter which, incidentally, must be stored inside your cabin. You cannot leave it outside the cabin under any circumstances, as this would prohibit staff from carrying out their duties and would be hazardous in the event of an emergency. Speaking of an emergency although, hopefully, there wouldn't be one, being in a wheelchair does not excuse me from attending the compulsory fire evacuation drill. Whilst there are life jackets in my cabin, I may not be able to get there in a hurry but one is always available at the muster station and, if needed, assistance in putting it on. Inside the cabin everything is at a height which suites wheelchair users. The shower room is fully accessible, the toilet seat, folding shower seat, light switches, sink etc are again, all at a height suitable for people with disabilities. The cabins themselves are slightly larger to allow wheelchairs to get around easily. The dining rooms and entertainment venues are very accessible, with spaces specifically for those of us with disabilities. Out on deck there is plenty room to move about. 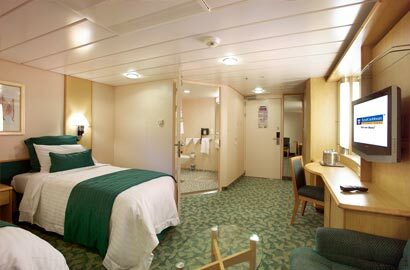 On most ships at least one of the swimming pools and jacuzzis will have a hoist, operated by a member of staff, for those of us who need assistance in getting in and out. Going ashore at the ports of call? That’s fine as long as the ship is alongside the quay and the gangway is not too steep. Appointed crew members are on hand to assist. However, the crew cannot assist with other matters, such as washing, dressing etc. If I were to require such assistance I would have to have someone accompany me. In some ports of call, although not all, there may be coaches or taxis with ramped access. I can request accessible transport, should I want to go on an excursion, at main reception (Purser's) desk the previous evening. If the ship is at anchor and passengers are tendered ashore, then it is up to the Captain to advise if we can go ashore. For example it may be possible to get onto the tender but it may not be possible to get off shore-side due to problems such as steep steps or narrow passageways. I have to admit that, for me, cruising is one of, if not THE best way to see the world... or at least part of it. If anyone is unsure about this, I would suggest booking a short 3 - 7 day cruise to begin with. Go with an open mind. 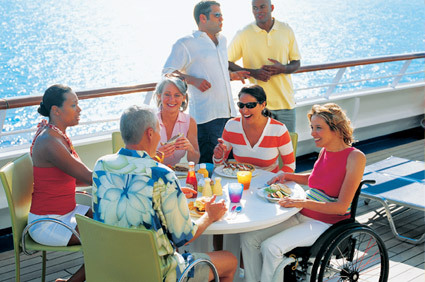 Most people with disabilities, cruising for the first time, are very pleasantly surprised at just how accessible cruising is. You may be too!